Rise of the Liberators is a kind of prequel to Hyatt’s recent Stay Younger Longer. I say ‘kind of’ because it’s more establishing the world that SYL occurs in more than telling any stories about the early lives of the characters in SYL. 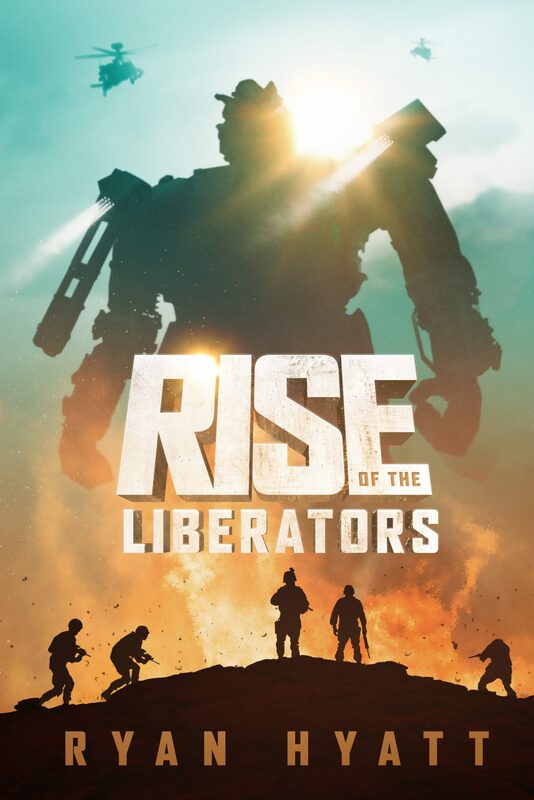 At first glance, the book seems to be setting up to being an action story about giant mechanized robot suits (dubbed ‘Liberators’), but after a short while it becomes clear that the Liberators are just the backdrop to explore a quieter, more thoughtful exploration of a family-level view of tumultuous geopolitical events. The United States of Rise of the Liberators is set just a few years from now, but is one where there was no recovery from the Great Recession, which has since become the Greatest Depression and economic inequality (rather than all out ruin) has left the U.S. government in a desperate position to secure the twin lifebloods of natural resources (oil) and public favor (support for unilateral war) to maintain some semblance of order. In a lot of ways, the geopolitical events here echo the Iraq war, but without any pretense of freedom or liberation (despite the name of the robots), simply revenge and resource acquisition. Hyatt’s writing keeps the pages turning and he has a few wonderful set pieces that have an almost cinematic quality (one early chapter involving a gang of baby stroller thieves is particularly memorable). That said, some of the family scenes come off as a little overly sentimental and only serve to underscore that Hyatt’s talent is better suited for building the backstory and little details of this alternate future. A middle section (which could be a novella in its own right) is probably the strongest of the book because it is light on sentimentality and more assuredly focuses on the hypocrisy of political and economic leaders manufacturing inanities to dominate the public’s attention while more sinister plans are being played out. This middle section almost veered off track (though it was an enjoyable detour) until tying back into the main narrative in spectacular fashion (another memorable scene I won’t spoil here). More than the rest of the book, this middle section lays the groundwork for the world of Stay Younger Longer. My only real complaint is that the book ends just as soon as we get to the part of the story I’m most interested in: how a relatively familiar looking US could become the world of Stay Younger Longer. The book ends on a cliffhanger that makes me hope the next book comes out very, very soon. There are a lot of unanswered questions of the “what happens next?” variety and I wonder if the sequel will pick up right where this leaves off to answer some of those questions, or whether it will be self-contained the way this is relative to Stay Younger Longer. Overall, the book is easy to pick up for a single chapter or sit down and read for a while. The most striking feature is the way the protagonist (and in some ways the narrator) alternates between jingoism and pacifism. Ray sometimes sounds like a commentator for Fox News and a Communist Party recruiter in the course of a single paragraph. This seemingly disjointed character comes off to me as the book’s greatest accomplishment: positing a near future where the concept of ‘moderate’ politics all but disappears and individuals and corporations are in a constant state of flipping from one extreme view to another. It’s a great, subtle commentary on the current political climate and a lot more intellectually challenging and rewarding than the image of the giant robot on the cover would suggest.